New York, NY - His Grace the newly-enthroned Bishop of the Eastern American Diocese Irinej served the Divine Liturgy in New York City on Sunday, October 2, 2016, in Madison Square Park, located close to St. Sava Cathedral. Serving with Bishop Irinej was His Eminence Metropolitan Georgios of Guinea and Western Africa, along with clergy: Protopresbyter-stavrophor Dr. John Behr, Dean of St. Vladimir's Orthodox Theological Seminary; Protopresbyter-stavrophor Aleksandar Vlajkovic, Dean of the Washington Deanery and parish priest in Boston; Protopresbyter-stavrophor Dr. Zivojin Jakovljevic, Dean of St. Sava Cathedral in New York City; Protopresbyter-stavrophor Ivan Marjanovic, parish priest in Portland, Maine; Protopresbyter -stavrophor Dr. Alexander Rentel, Professor of Canon Law at St. Vladimir's Seminary; Protopresbyter Djokan Majstorovic, parish priest in Paterson, New Jersey; Protopresbyter Zoran Radovic, parish priest of St. George Church in Elizabeth, New Jersey; Protopresbyter Vladislav Radujkovic, parish priest in New York City; Presbyter Sasa Nedic, parish priest of Holy Ascension Church in Elizabeth, New Jersey; Presbyter Christopher Rocknage, parish priest in Steelton, Pennsylvania; Archdeacon Joseph Matusiak, Protodeacon Vadim Gan, Deacon Dr. Jovan Anicic, and Deacon Larry Soper. Responses were sung by the Cathedral choir directed by Dr. Milos Raickovic. This day was particularly unique because His Eminence Metropolitan Georgios of Guinea and Western Africa was present. Although he is himself a missionary, a preacher of the Gospel of Christ on the African continent who has attended many celebrations, he was especially elated to have the opportunity to participate in this service. Addressing Bishop Irinej and the faithful present, the Metropolitan declared that Bishop Irinej is the only person who by his energy and strength could have succeeded in bringing about this historic moment. “Although I did not understand much of what was said in Serbian today during the services, that did not bother me because I feel that we share the same spirit of Orthodoxy. What connects us is not language, nor the land of our origin or the nation from which we have come, but rather our faith in Jesus Christ and the Orthodox Church. 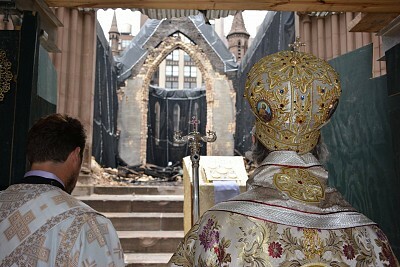 When I sent photos of today's services to Greece to witness to and share the experience, and to show what the Serbs are doing in the center of New York, they were immediately published in the press.” According to the Metropolitan, faith in the Lord Jesus Christ and love for Him is the foundation of psychological and physical stability, without which it is impossible to master oneself. Speaking of unbelievers and those who consider faith to be a mental illness, His Eminence emphasized that it is actually unbelief that is the source of insanity, because of which people today medicate themselves constantly to control their nerves, their bodies and minds. Exhorting Bishop Irinej to persevere in preaching the Gospel, the Metropolitan pointed out that we Christians, while condemning jihadists and Muslims for the things they do for their faith, do not ask ourselves what we have done to witness to Jesus Christ. That is why it is necessary, in the Metropolitan's words, that we, as witnesses to the Gospel, not be ashamed of our faith, but rather that we together openly proclaim it. For, although we speak different languages, we believe in the same God. Expressing his joy that Serbia is Greece's best friend and neighbor Greece has, Metropolitan Georgios concluded that these two peoples who continue to grow in their firm faith are extraordinary because, by God's grace, they never gave in during the 450 years of the Ottoman yoke. This meaningful gathering was documented with a large number of photographs, which testify to the sublimity and great beauty of this historic event. In them are seen the radiant faces of the faithful, shining with universal hope. But no matter how magnificent all these physical images and words may be, they are not adequate to show the warmth of grace which radiated on that day.